Megan and I were in Munroe Falls, Ohio today and yesterday to visit my parents and brother and celebrate my brother's twenty-fourth birthday. The weather yesterday was clear and warm, perfect for visiting a few places where my love of natural history was nurtured as a small child. 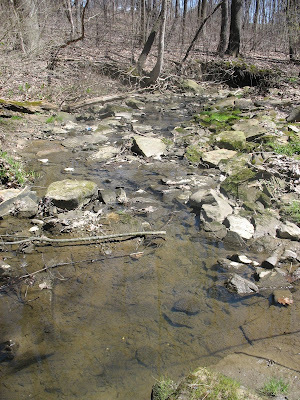 Behind our house in Munroe Falls ran a small, spring fed stream lined with sandstone and shale. It was here that I found some really cool stuff growing up. I managed to rediscover many of the things that I found fascinating when I was a kid. Here you can see "The Creek". It is quite sunny there now without the leaves on the trees. Notice the sandstone strewn about. 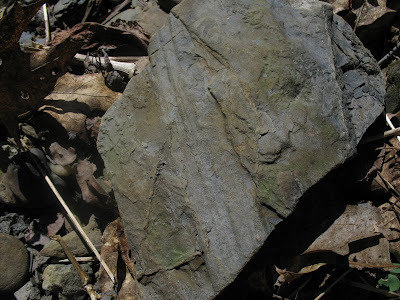 These rocks are perfect habitat for an animal that I would spend hours catching-- the Two-lined Salamander. 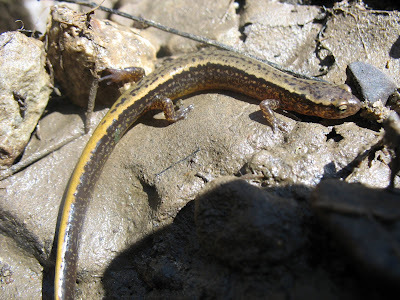 I wanted to see if the salamanders still lived in the creek. It did not take me long to find one. I overturned one of the large pieces of sandstone to reveal this little guy. Satisfied at finding the two-lined salamander, I next turned my attention to the rocks under which the salamanders hide. I had always noticed strange parallel lines running through the sandstone. I later learned that the sandstone here was full of fossils from ancient plants called horsetails. The rocks in the stream are at least 286 million years old, and formed when non-flowering plants like the horsetails, which are considered a "fern ally" dominated the landscape. After looking for about 5 minutes, I managed to find this specimen. Although weathered somewhat, you can clearly see the ridged outline of the plant. I really think these fossils are amazing! This is a beautiful post, Tom. Thank you for sharing.